What to do about war and soldiers? Buddhism teaches us non-violence towards others; violence towards other living things is contrary to the teachings of the Buddha. Historically, Buddhists have, on the whole, adhered to this precept. The Buddha taught us to overcome and avoid suffering. Therefore, we cannot impose suffering on others. Killing not only causes suffering for the person who is killed but also causes suffering for their family and friends who have lost their loved one. It is also the seed of future suffering, with bad karmic consequences for the killer. Buddha demonstrated non–volence is stronger than violent reaction in the story of Angilimala, a serial killer who killed 999 people and wanted Buddha as his 1000th victim. The Buddha also taught us to show love and compassion to others in place of hate and violence, and not just love for our friends but equally for our enemies, or those who seek to do us harm. One cannot become enlightened without compassion; killing is the fundamental opposite of compassion. The only exception might be — in the opinions of some — a mercy killing such as euthanasia for terminally suffering beings, or defending another innocent being from harm. But when I refer to killing, I am referring principally to war, murder and killing. The Buddha spoke about non-violence in many sutras, some of which I list below. The Buddha taught through his activities and actions as much as through his words. 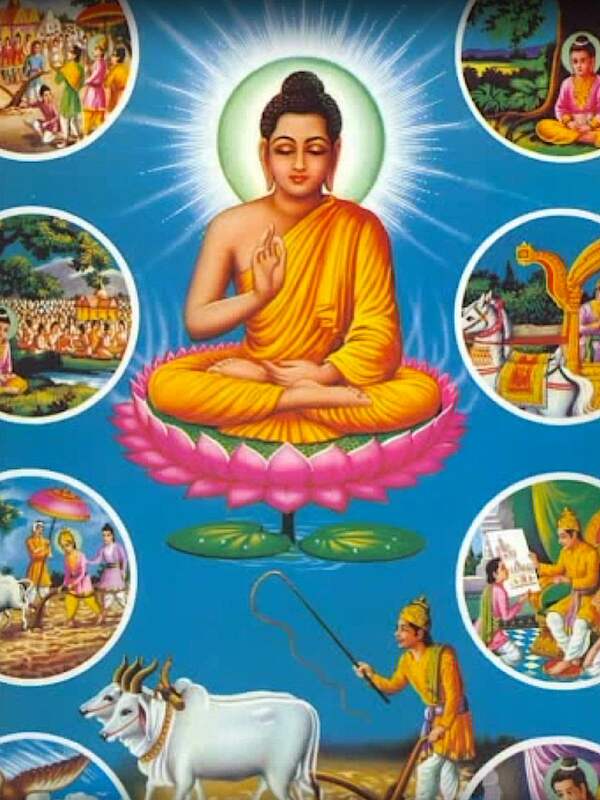 Scenes from sutra stories of Buddha demonstrating how Buddha applied non-violence to practice. “That one I call a brahmin who has put aside weapons and renounced violence towards all creatures. Such a one neither kills nor helps others to kill…That one I call a brahmin who is never hostile to those who are hostile toward him, who is attached among those who are selfish and at peace among those at war”. A ‘Brahmin’ is a member of the highest and priestly caste of Hinduism, The Buddha rejected the caste system; what he is declaring here is that the “Superior caste” — the Brahmin — is one who doesn’t kill and isn’t hostile to anyone, rather than someone born into the caste. There are countless passages in Sutra, where the Buddha is even more explicit — that killing is wrong even where it looks like there is no other choice. “Monks, even if bandits were to sever you savagely limb by limb with a two-handle saw, he who gave rise to a mind of hate towards them would not be carrying out my teaching”. This statement seems to be the most extreme form of non-violence possible. The Buddha is clearly saying here that even if someone is killing you, hating him would be contrary to the Dhamma. To many non-Buddhists and maybe even some Buddhists themselves, this seems illogical. How can one not hate — and not only that, have compassion for — someone who is hurting them, or who wants to kill them? But in order to do this, it would obviously require the highest compassion. 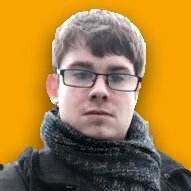 How should Buddhists react to people such as killers? It is clear from the teachings of the Buddha mentioned above, that Buddhists should embrace non-violence towards others and condemn killing and harming others as something terrible that will also result in bad karmic consequences for the killer. 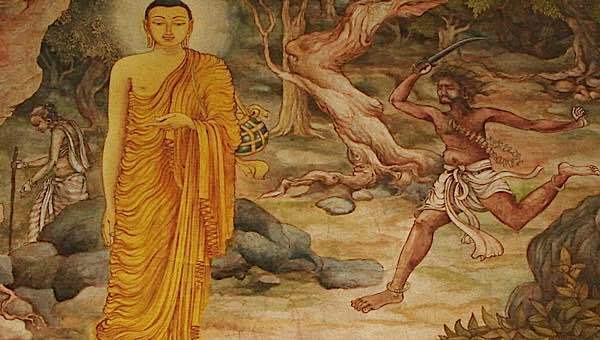 The story of Angulimala is one of the most famous in the Buddhist cannon and one of the stories I believe that we can learn most from to apply to today’s world. Angulimala became a serial murderer, killing innocent people and terrorising many others. He chopped off their fingers and made them into a necklace and thus became known as “Angulimala” (translates as Finger Necklace). 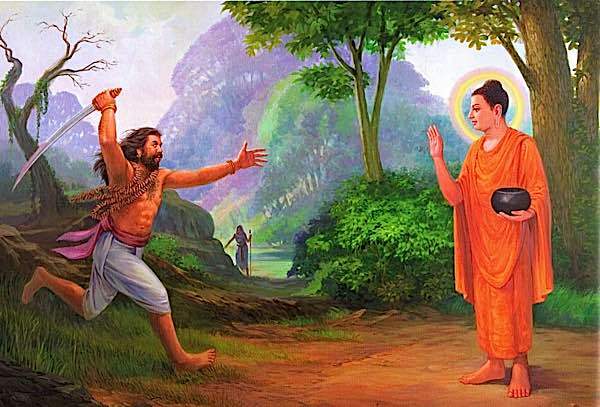 Shakyamuni saves Angulimala from himself. The mass murderer tries to take Buddha as his 1000th victim. When he fails, he falls to Buddha’ feet and asks to be taken as a monk. Although Buddha agrees, Angulimala must endure endless beatings at the hands of his victim’s families. He was a wanted criminal by the state, killer of 999 people. 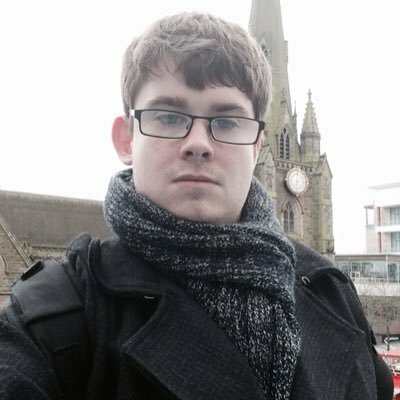 He was someone who was viewed as irredeemable evil, with no hope that he could become better. The Buddha refused to believe this and went to talk to Angulimala, even though he was warned by almost everyone not to do so. 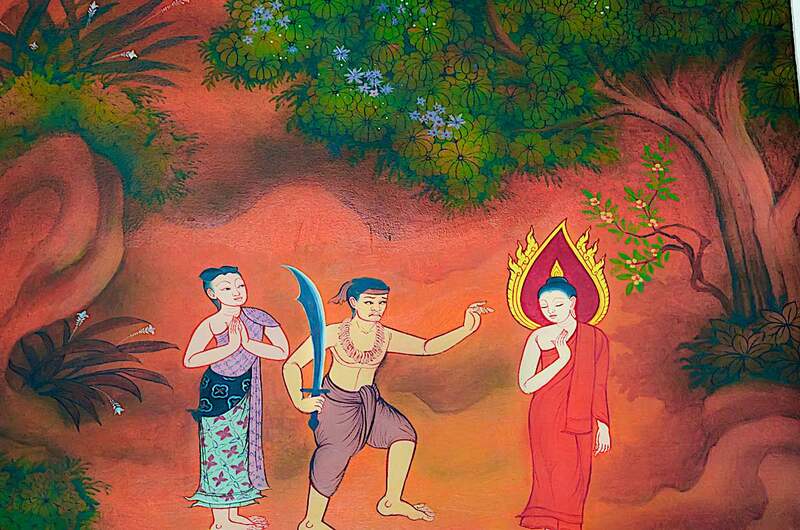 Angulimala saw the Buddha coming and ran towards him in waving a knife. However, no matter how fast he ran, and even though the Buddha was walking at his normal pace, Angulimala couldn’t catch up to the him. He eventually called out to the Buddha to stop. “I have stopped Angulimala, you stop too,” Buddha replied. “Angulimala, I have stopped forever, I abstain from violence towards living beings. But you have no restraint towards things that live. That is why I have stopped and you have not”. Angulimala relents and realising the error of his ways, he takes refuge in Buddha, and becomes a monk. He changed his name to “Ahimsaka” (non-violent one) to reflect his new identity and change of heart. “Venerable sir, we ourselves could not tame him with force and weapons, yet the Blessed One has tamed him without force and weapons”. Ahimsaka’s life as a monk is far from easy. Often, when he went for alms he was attacked by people who remembered him and what he did in his former life. However, he takes all this as it comes and does not retaliate towards his attackers. The Buddha tells him that this is the result of his actions and that him being attacked is his karmic debt being paid off. Ahimsaka later became enlightened and became an arhat, after years of purifying the negative karma of his violent past. 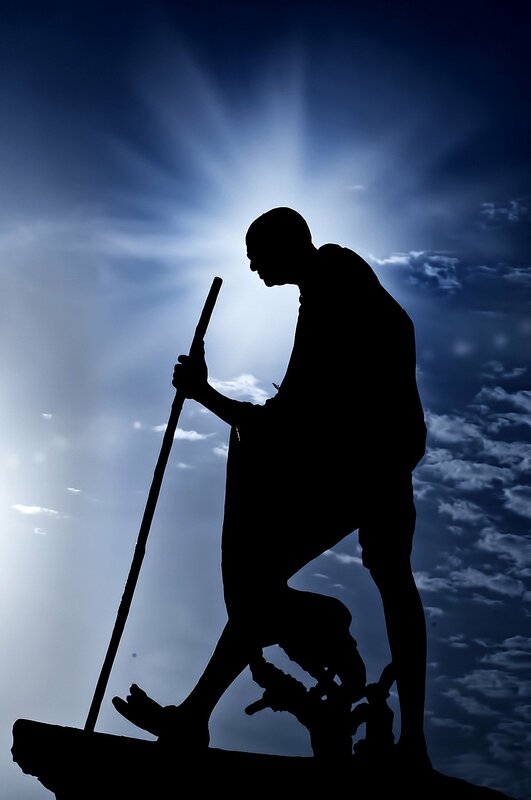 The great Mahatma Ghandi exemplifies Ahimsa non-violence in the modern era. From this story of Angulimala — and many other similar stories — it is clear that Buddhists must avoid killing and creating suffering. Equally, we should not hate someone who creates our suffering. We might object and disagree with the negative action, but we should view all sentient beings as redeemable. Because of these teachings, for example, (in my opinion) Buddhists should also be against the death penalty because it goes against the principle of Ahimsa. I, as a Buddhist, of course think that criminals and wrong-doers should be imprisoned to pay for their crimes, in the same way that Angulimala had to pay for his. Some criminals end up being forgiven by the families of their victims and end up making up for their actions. They must have at least the chance to do this and from a Buddhist perspective, repay their karmic debt. 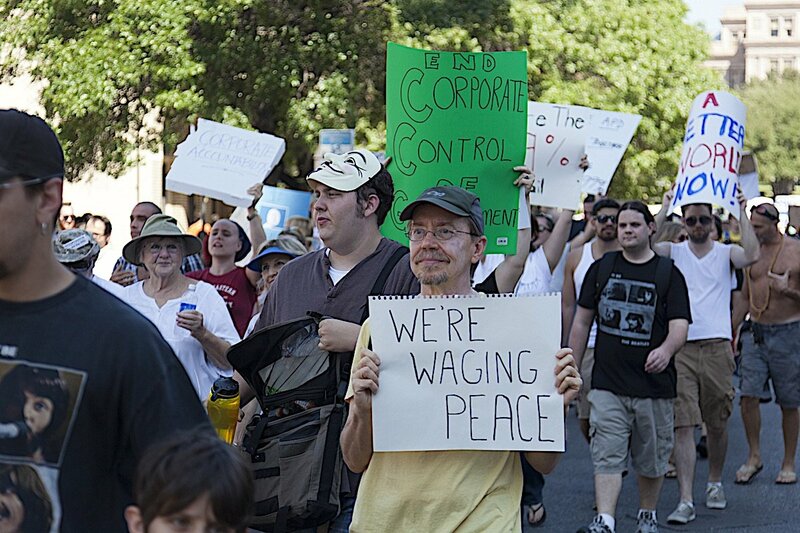 Occupy Austin — and other Occupy protests — arose spontaneously and, mostly, peacefully. 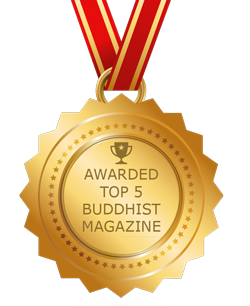 Buddhists are generally opposed to war; it goes against the fundamental teachings of Buddhism and the first precept. However, Buddhists are against the practice of war — not against the soldiers fighting in it. As the Dalai Lama also says later on, the vast majority of soldiers join to defend the country, or establish themselves in a good career — not to kill. In short, soldiers join with good intentions. Therefore, it is unacceptable to claim that soldiers are somehow responsible for murder. Buddhists are against killing and war — not the people fighting the wars. 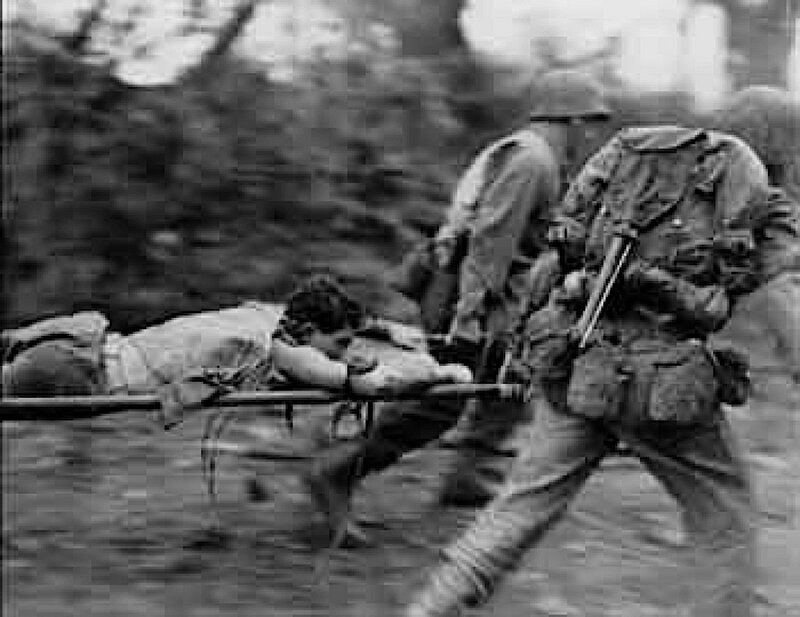 The war hero Desmond Doss, a combat medic in World War II, saved many lives and is only non-combatant “Conscientious Objector” soldier to win a medal of honour. He refused to carry a gun or to shoot an “enemy” but he would risk his life a hundred times for a fallen soldier. A movie of his life, Hacksaw Ridge, released in 2016. Why is this concept so important? Because, refraining from killing isn’t enough. Reducing suffering of others also requires “action” — karma in Sanskrit. 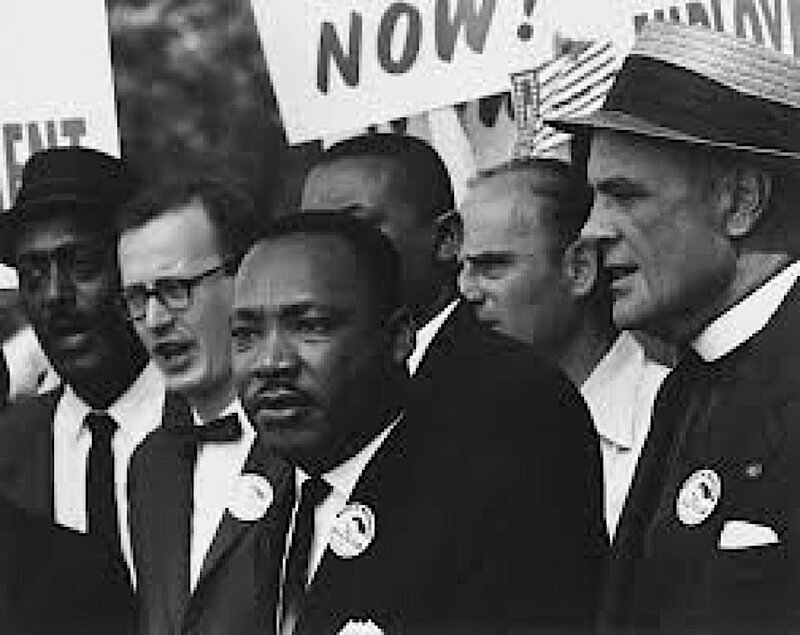 If we are to decrease suffering, we cannot let injustice continue unopposed. Therefore, non-violent resistance against oppressors, aligns best with Buddhist teachings. In the sixties, this might result in a “sit in protest” against war, or the civil rights movement. Today, we might think of the Occupy movement. 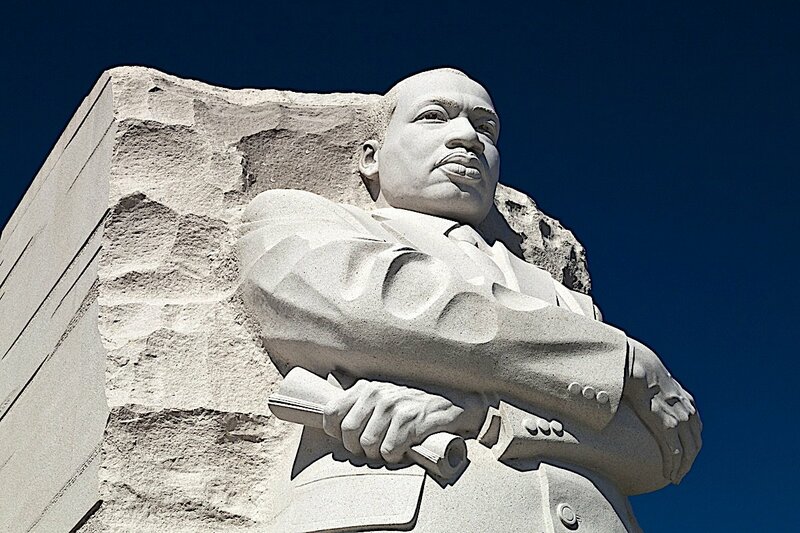 Dr. Martin Luther King Jr. memorial in Washington DC. The heroes who are fondly remembered tend to be the ones known for peace. 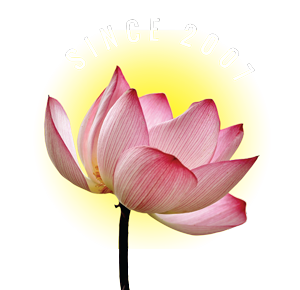 Ahimsa has been a part of Buddhist tradition since ancient times. In modern times, Ghandi made the concept famous. Ahimsa is one of the greatest gifts from India to the rest of the world taught by the Buddha, Mahavira of the Jains, Guru Nanak of the Sikhs and the ancient sages of the Hindu tradition. The Mindfulness of Feelings: Overcoming Negative Feelings and Using Discriminating Alertness of Feelings in Your Practice: Mahamudra Teachings from Zasep Tulku Rinpoche, Session 3.